As part of Bluegrass in the Park, the accompanying Folklife Festival will be held August 11 from 10 a.m. – 2 p.m. in Audubon Mill Park. Dulcimers and Then Some – As well as performing on stage during the Bluegrass Festival, the Shade Tree Players will be on-hand at the Folklife Festival to talk about the array of instruments they use to create their unique sound. The dulcimer is their core instrument, but they also play guitar, ukulele, wash-tub bass, mandolin, and autoharp. Fried Apple Pies – Children can make and eat their very own fried apple pies. Presented by Reva Mitchell and the Henderson County Cooperative Extension Office. All Things Herbs – Need an acne remedy? Want to soften your hair? No need to make a run to the store – just look in the cupboards! Master Gardener and beekeeper Debbie Lowrance will share home beauty remedies using honey and herbs! Making Beeswax Candles –Bees are good for much more than just making honey. Their wax has been used for a variety of purposes since ancient times, including the production of light. Children will get to learn about the wax that bees produce and make their very own beeswax candle to take home! Soap-Making – Lucia Felty remembers her grandmother always having homemade lye soap by her kitchen and bathroom sinks. As a child, Lucia had been fascinated by the odd shaped chunk of soap with its unusual scent. In 2003 she was asked by a friend to help make soap, which Lucia happily agreed. Lucia began studying soap making and by the year 2007 Lucia’s hobby became a business. Lucia is a member of Handcrafted Soapmakers Guild, a Certified Advanced Soapmaker, and a Juried Participant in Kentucky Crafter Arts Program. Demonstrations will be begin at 10:30 am, 11:30 am, 12:30 pm, and 1:30 pm. Made by Hand – Peter Chevalier will demonstrate making homemade post and rung chairs. Civil War Seamstress- Mary Hesner will bring her Civil War Canvas Tent, as well as articles of clothing. Hesner sews everything by hand. The Wheelmen – This group will bring a variety of antique bicycles and printed materials to display, and will ride the bicycles, giving a brief informational session on how bicycles evolved over time. They will also be wearing cycling clothes of the 1880’s and 1890’s. Angel Mounds Presentation: Flint Knapping – Flint knapping is the process of making stone tools (i.e. arrowheads, projectile points, hand axes, etc.). The ancient art of flint knapping has been around for about 4 millions years. Flint knapping has evolved as man has evolved. Only a few small groups of people in remote parts of the world still knap as part of their daily lives. For more information visit www.bluegrassinthepark.org or call (270) 826-3128 or toll free 1-800-648-3128. 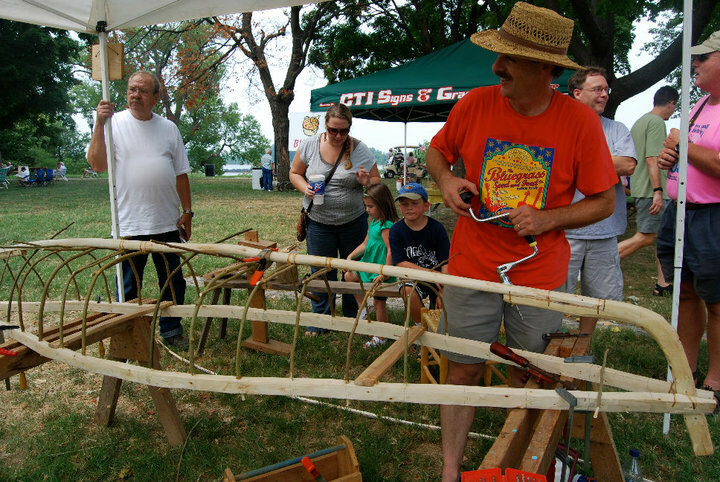 The 27th annual Bluegrass in the Park Folklife Festival is set to take place August 10-11, 2012, in Henderson, Kentucky. The festival will feature great Bluegrass music, events, and food, all in an incredible location on the banks of the Ohio River.